Walgreens, Motorola Mobility and Google are three of the bigger names that have -- or are about to -- move some of their high-tech operations to downtown Chicago. And there are a number of other lesser-known companies that are creating a high-tech boom in the Loop. It's a phenomenon that some city boosters would like to believe is transforming Chicago into the Silicon Valley of the Midwest. Whether it is or not is up for debate. But what it is generating is a vibrant community of mostly young workers in the Loop -- and their numbers are growing. 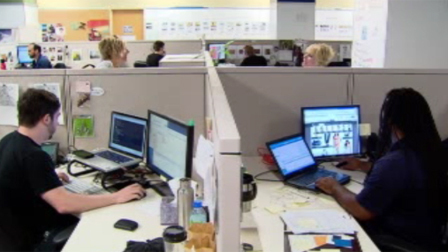 Like many people in today's workforce, the employees at Sears eCommerce Development Center in downtown Chicago spend their day staring at computer screens and entering data. They're the ones who develop, design, write copy for, and even analyze the famous retailer's online catalog. These mostly young people are part of an exploding workforce in the Loop. Sears is one of a number of well-known and not-so-well-known companies that have located or relocated their eCommerce business to downtown Chicago. The reason they've been lured to the Loop is because of people like 32–year-old Vizente Freeman. Like many of his colleagues, Freeman is young, lives in the city and has the high-tech skills that more and more companies require. But there's another reason that companies like Hoffman Estates-based Sears are shifting their high-tech operations downtown; and the reason is cultural. A few blocks away from Sears is a lesser-known company called Ifbyphone. It helps companies with voice-based interactions with their customers. It sounds high-tech, and it is. The company was started by entrepreneur Irv Shapiro about seven years ago in Skokie, but was forced to move downtown to tap into the talent pool that he wanted. “When we said to someone in their early 20s, who was living in Wrigleyville or Lakeview or the West Side of the Loop, we said, ‘come to Skokie, it’s easy. You can take the El.’ They said, ‘Well, I have to transfer at Howard. It’s really cold in the winter here.’ And so, it was very hard to attract people, and impossible to attract people from the western suburbs,” said Shapiro. One of Ifbyphone’s employees, who wanted no part of a commute to the suburbs, is the company's manager of technical operations. Jeremy Alons lives in Chicago's Logan Square neighborhood. While location and salary may be important factors in attracting the best of the high-tech workforce, there's also something else many companies are providing: the business culture young people want. Whether it's a game room where employees can slip away for a fast game of Pinball, or providing scooters to let workers have some fun getting around a vast workspace, or even fostering an atmosphere that allows techies to bring in their favorite sci-fi and superhero figurines, it's all part of the modern, high-tech workplace. While some members of Chicago’s tech community would like to think the city is becoming the next Silicon Valley, Chicago is still a long way from having the likes of Apple, Google, or Facebook here. However, one expert says Chicago does have some advantages over the famed West Coast community. Entrepreneurs also give city officials credit, saying over the last decade they've helped generate the buzz that's making Chicago a high-tech mecca. Even the media is being given some credit. Any fears that the tech boom could turn into a bust may have to wait. Ifbyphone alone says it plans to double its workforce in the next 18 months. Walgreens also says its recently relocated downtown eCommerce division will continue to grow.